The Oak Room, Millennium Seoul Hilton's traditional English-style bar, has temporarily closed the popular BBQ Happy Hour due to cold weather. In its stead, the Carvery Wine Buffet will be featured at the Oak Room for a cozy dinner starting Monday, January 16 and continuing through to the end of March. Every evening from 6:00 p.m. to 8:30 p.m., you can enjoy a buffet of salad, cheese and a carving station of the juiciest and most delectable roast beef. In addition, enjoy unlimited wine, a perfect accompaniment to the roast beef and cheese on cold winter nights. Unlimited draft beer and soft drinks are also available at this buffet. The Oak Room features a log-burning fireplace to add to the ambience and coziness of this English-style bar. All this is available to you for the bargain price of KW25,000++ per person. The Carvery Wine Buffet is the perfect way to wind down after a busy day at the office or to get the party started for the weekend with colleagues and friends. With the colder weather settling in for a few more months, the Oak Room's Carvery Wine Buffet is the ideal way to enjoy your friends' and colleagues' company in a warm and comfortable environment. 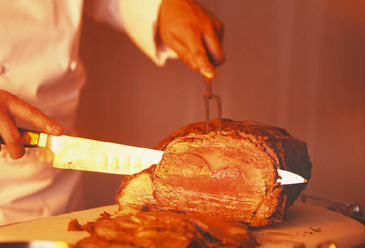 Come and enjoy the Carvery and Wine Buffet at Millennium Seoul Hilton's Oak Room. You'll love the food and drinks, the price and the service!